701. Field of Glory may look like a unit-based game at first, but author Simon Hall and other veterans attest that to make an army work you need to think in terms of groups of BGs serving coordinated tactical purposes. Experience suggests that people who treat BGs as independently operating units and overfocus on one-on-one opportunistic match-ups rapidly start losing to those who think in grand tactical terms and coordinate BGs in positional or mission-driven brigaded groups â€“ brigades with roles that can be expressed in tactical terms such as pinning center, offensive wing, defensive wing, reserves, enveloping force, etc. 702. This said, lone BGs are good as a reserve, for capturing Camps, dealing with terrain, chasing routers, and other tasks where they are effective alone. But a brigade of two or more BGs working together still has many more alternatives for manoeuvre, shooting and charges and can multiply the possible threats against opposing BGs. I particularly urge using LH in pairs or trios in combat roles rather than singly, although LF can sometimes serve as a partner for LH. 703. Skirmishers in front of shock troops can protect them from cohesion loss from enemy shooting and insulate them from enemy Skirmishers seeking to provoke an uncontrolled charge. LF are easy to handle as they can interpenetrate freely. LH ahead of the battle front require care since a gap is needed to evade or withdraw behind heavies without bursting through, so drill your LH with your heavies before using them between the lines. The gaps can easily be filled if the heavies are in deeper than normal formation so they can expand to fill the gap in the Manoeuvre Phase (or in Melee). 704. Donâ€™t be afraid to have Commanders lead Skirmishers forward on the first turn deep into the 18 MU zone between the deployment areas in order to limit the enemyâ€™s ability to Second Move (slowing him is often but not always desirable) and to counter enemy lights on the same mission. In the following Joint Action Phase Commanders can fall back towards the battle line being led forward by another Commander. 705. A march column behind the join between BGs, or a perfectly positioned 2-wide formation, provides rear support and rout lanes and can be close enough to the battle line to plug gaps or block/attack pursuers, though with Undrilled it can take personal leadership of a Commander to get them to act quickly enough. Angling the BG in the right direction can improve rear support capability â€“ 2x2 can provide 3 bases of support to one BG and 4 bases worth to its adjoining BG while 2x3 can provide 5 & 5. In addition to good positioning, support columns should have plans for deployment to either flank or to the front if needed. They may need to act as a grand tactical reserve. 706. Rear support and flank cover BGs should be brigaded for doctrinal and tactical planning purposes with the front-line BGs they are supporting unless they have another specific task, though they need not be in the same deployment quarter. Rear support costs you troops that are withheld from the front line, and whether this is cost effective depends on BG cost and tactical considerations. Triarii are effective for Republican Romans. Mobs are effective for supporting multiple Poor BGs, and indeed when combined with an IC can render even Poor troops almost invulnerable to shooting Cohesion Test failures. Putting worse fighting troops in front has some advantages â€“ they get rear support from the higher quality troops behind, and the rear supports are more likely to take out pursuers rather than be swept away in a rout. 708. Weak troops can handicap their strong neighbor BGs in close combat against a common opponent since the enemy might suffer more hits than it inflicts against the strong BG but offset that loss with an equal net hit advantage against the weaker BG. 709. Donâ€™t deploy wider than you intend to fight without a sound reason and confidence that you will be able to change to your battle formation as needed. Deploying narrower is not usually a problem. Deepening front-line formations by an extra rank or partial rank preserves combat power by providing replacements for the fighting ranks in the event of base losses and the narrower frontage makes it harder for the enemy to inflict 1 hit per 3 bases on it from shooting when the BG has friends on each flank. Troops can always expand once in combat, so troops with weak impact factors may want to consider attacking in deeper formations and expanding out once in contact. 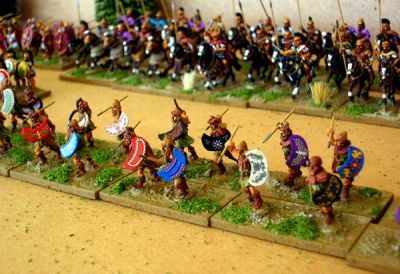 Large warband BGs facing Romans are frequently stiffened in this way, with 8 bases deploying 3-wide, 10 4-wide, and 12 4- or 5-wide. Spearmen rely on their 2-rank POA so often do this as well. Deploying in one rank is sometimes necessary to avoid gaps, herd Skirmishers, or for other reasons, but is vulnerable in close combat and facilitates concentration of enemy shooting. 710. Temporary or permanent gaps in the line can be tactically useful to allow non-LF friendlies to charge out or evade back or to allow deep formations the option to deploy. The risk is overlaps (the narrower the BGs in the battle front, the more likely a single overlap can tip the balance) or the gap being penetrated â€“ having second-line BGs to counterattack or fill the gaps is prudent. 711. Position to avoid burst-through by evaders and routers â€“ remember the troops running back can only shift one base width to avoid friends to the rear. Formations are worthy of a lot of drill to get the positioning right. 720. There are some principles of order of march. Sometimes you can mislead the opponent into misreading your battle plan and seriously misdeploying before your later deployments surprise him, but this is not common and usually involves suitable terrain. Practical deployment areas and formations are usually fairly obvious, and itâ€™s often hard to avoid the obvious match-ups in the center of your position (where else would the Pike blocks go?) so the main objective in order of march is usually to allow you to weight a flank more heavily, position a reserve, make a play for certain terrain, or delay placement of certain troops sensitive to match-ups (archers and other Medium Foot commonly fit in this last category). 722. Troops which will usually have only one real option for deployment can go first, but it is more common to put the most manoeuvrable troops down first since their position can most easily be corrected later. Fast troops that can easily redeploy can be put down early in the order of march (such as mounted reserves or Skirmishers that donâ€™t need to wait to deploy based on placement of the infantry they need to screen). Ideally this placement can serve as a feint or offer several threats to complicate your opponentâ€™s planning. 723. Standard skirmisher screens donâ€™t give much of your plan away so can go down early, though you may want to defer light BGs whose exact positioning will be critical. Unless you want to save one or two BGs for later to take advantage of an opportunity on a flank, LH can generally go down early, and LF likewise in terrain and facing infantry. However, since â€œLH/LF firstâ€ deployment is common, holding back LH BGs until your last deployment can surprise your opponent and outmatch his lights on one wing. 724. Reserves are ideally good quality mobile fighting troops not placed too far from the center of gravity of the army, in which case putting them down first does not disclose much, or they can be used to misdirect enemy attention by being placed on a flank in the first quarter and then moved inward once the battle commences. 725. Low-quality troops tasked as Camp guards or for skulking in the rear also generally go down early so as not to waste the opportunities provided for fighting troops in later deployment quarters. 726. When you only have one BG of an important troop type, it may be prudent to deploy it late in order to make best use of it. Strong and homogeneous heavy foot battle lines can go down early, in the first or second quarters, followed by their supports, but possibly leaving some heavy foot BGs for the third or even fourth quarters, which can be useful to adjust their center of mass or provide the option of a detachment to counter a particular threat after seeing more enemy deployments. Deploying a 2-wide BG (such as Elephants) behind 2 BGs in an already-deployed battle line can surprise an enemy, as the front rank units can almost always use their â€œfreeâ€ 1-base-width sidestep in their first turn to create room for the additional BG to fit into the line. 727. Author RB Scottâ€™s prescription for Medium Foot is to generally deploy them last because they are match-up sensitive and not highly mobile. This is especially true for MF archers. If intended to take an offensive role, it is useful to adjust targeting by deploying them late. Exceptions to this could include those doctrinally tasked to guard the Camp, back up a main line, or control or contest terrain regardless of other troop dispositions. 729. As part of your pre-battle drills, write down orders of march and throw down terrain and practice putting troops down in alternative orders of march to gauge what would work best to accomplish your deployment goals without prematurely tipping your hand. Even better, repeat this drill with a live opponent and his army. 730. A few summary examples of order of march: Parthians put down Camp guards (if any) and a spread of LH across the front first, then LH and any LF to respond to enemy deployments, then Cataphracts (and any combat infantry) last where ideally they are positioned to make multiple threats, therefore inflicting a dilemma on the enemy with the intention of using a pin-and-punch battle plan (See Tip 836). Numidians are also a pin-and-punch light army and would usually defer placement of match-up sensitive strike troops (such as Elephants). 731. Republican Romans might put down some lights and a reserve cavalry BG first, then several legionary BGs, then more legionaries on one side or the other of the first (depending on what the enemy is doing), then the flank support troops to weight the army to one side or another, and finally any Medium Foot. 732. A Hellenistic army is usually built around delivering the Pike phalanx to its targets while also striking with an offensive wing. The uncertainty is usually not where the Pikemen go but the roles and weightings of the flanking â€œbrigades,â€ so the first deployment might be lights and the second Pikemen, or vice versa. Then flanking Spearmen and mounted would be deployed thereafter â€“ which wing is the offensive wing might not be clear until the last quarters. 750. The obvious use of a flank march is to place a friendly force past an enemy flank where it is not practical to envelop it by manoeuvring on the field. If he has an exposed Camp or low quality filler troops in the back, a flank march can make him pay for it, or of course you can take his wing or center in the rear if the flank march arrives before the fight is decided. If you are lucky, your opponent will over-react or under-react to a flank march, by a hasty attack or hesitating to engage. Flank marches are not for all armies â€“ they are wise only for a minority of armies in some circumstances. 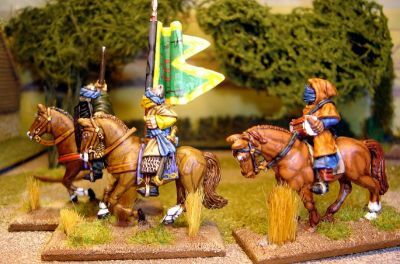 They also work much better with suitable troops (Skirmishers or mounted, especially Superiors who get straggling rerolls) and a Field Commander, the least common type of commander normally used. Large and Skirmisher-heavy armies should always consider flank marching in doctrine and planning as a way to bring troops to bear on a wider frontage and avoid being bottled up by opponents. Flank marches are a waste against opponents you can outwing and outflank on the table. 751. Note that flank marchers (and ambushers) are in effect bumped to the back of the order of march, with all the on-table troops moving up in the order of march. This gives the enemy more ability to respond to their deployment, but he canâ€™t exclude the possibility of a flank march or real ambush until the end of deployment or you fail to roll for flank marches at the start of your first turn. 752. An obvious flank march (vs. one masked by ambush markers) encourages your opponent to attack you quickly to take advantage of his temporary numerical superiority, which may suit you if you prefer to start with a defensive battle and have suitable terrain and troops. For this reason, however, a sizable double-flank march is hazardous because the balance of available forces is even more unfavorable for you on the table. Alternatively, your opponent may be unnerved or cautious and reposition forces to defend against or trap a flank arrival, giving you time to skirmish while advancing your line of battle to engage other troops or exert converging pressure when the flank march arrives. Ideally, you want the rear of the enemyâ€™s main line of battle to be convenient to your flank marchers once they arrive. 753. The corollary of the above is that you should consider threatened enemy flank marches as part of your doctrine. Will they make you expedite your attack? Wait and see? Continue your plan while hedging your moves against it? Ignore it? 754. 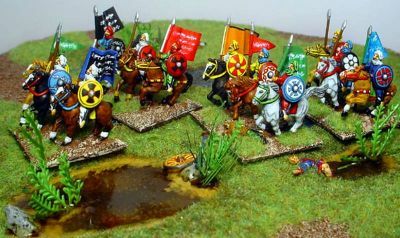 If you expect the enemy to flank march on one side, one response is to send a single small BG of Cavalry Lancers or Knights marching on that flank, which may be better than posting them on-table to guard against one. If there is no opposing flank march, you are likely to arrive on the enemy side edge as a potentially serious threat to the flank or rear of the army. If the enemy flank march is all Skirmishers, you drive them back and either play with them or ignore them and drive to take their battle line in flank or rear. If they force you back, they are delayed a turn and arrive with backs to the side edge where you may be able to catch them. If the marches are both forced back, both sides hasten forward to combat. 755. Ally Commands (see Tip 514) work well for flank marches since such contingents are not in the line of command of the rest of the army and therefore operate independently anyway.